There have been some complaints from people who argue it violates the separation of church and state. The county’s tax assessor Ron Wright explained his decision this morning, saying it’s “surprising” that this is even controversial. “It is a timely reminder of the values upon which our nation was founded. It’s historic, it’s iconic. Things that are iconic to Americans, like the motto, and the Pledge of Allegiance and the national anthem have helped define us as a nation,” said Wright. We’re seeing things in DC that are unimaginable, in the nation’s Capitol, literally erasing the word “God” from the structures. He said the critics of his decision are “perpetually offended and aggrieved” and seem to always be bothered by things that are fine with most Americans. 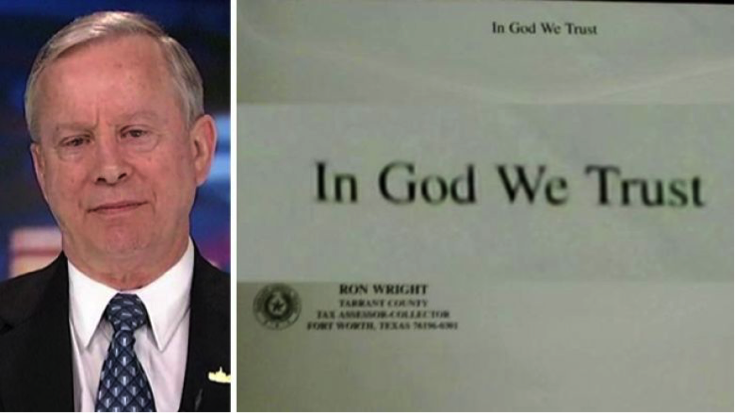 Wright noted that the “In God We Trust” motto applies to all religions and all Americans. Wright pointed out that it only cost an extra 3 bucks to print the motto, a price tag covered by a supporter from Kansas who mailed Wright a $3 check. Currently, The Congressional Prayer Caucus Foundation along with hundreds of other groups are part of a push to get Americans to display “In God We Trust” window clings on their cars, businesses, and homes. For more information on the In God We Trust MILLION WINDOW Campaign go to www.InGodWeTrust.com, or watch our video on YouTube. To book Lea Carawan please contact CJ Wheeler at 858-472-4285 or email her at cjradionews@gmail.com.